An activist holds a poster as she protests the election result in Bangkok, Thailand, March 31, 2019. Thailand is waving goodbye to its longest period of military rule in nearly 50 years — with a sweaty hand. Thailand's Prime Minister Prayut Chan-o-cha arrives to deliver a keynote speech at the opening ceremony of "National Fund to Reduce Inequalities" ahead of the general election, in Bangkok, Thailand, March 18, 2019. FILE - King Maha Vajiralongkorn, center, during Wesaka Bucha, at Emerald Buddha temple Bangkok, May 29, 2018. “Palang Pracharath still has some advantages in forming a coalition government. 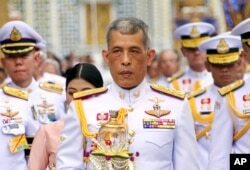 So there is no reason to stage a coup,” Prachak said. “This is different from the past. It institutionalizes policy implementation and development that are often halted by political instability,” he said. In its campaign, the Pheu Thai Party dented support for Prayut and Palang Pracharath, telling voters he bore responsibility for “exclusive wealth, expansive poverty” in the country.